Tired of Emailing Back and Forth to Collect Speaker Data? Whova’s Speaker Center Comes to the Rescue! Ellen screamed with pain when her boss told her to email 70 speakers to collect their information, including bios, headshots, and talk abstract, in order to put them online and start attracting registrants for their conference. She could already foresee the daunting task of emailing that many speakers back and forth to get all of their information collected. Honestly, she would probably react the same way even if there were just 17 speakers instead of 70. Let’s face it: the entire speaker management process, while necessary, is tedious, mundane, and messy. That doesn’t even account for those few procrastinators who need you to push them multiple times before they take any action, not to mention those perfectionists who constantly send you their re-polished bios over and over again. The best part? It’s available at NO additional charge for Whova customers. Through the Speaker Center, Ellen can distribute an online form to her speakers where they can upload session information by themselves whenever it’s ready. It’s easy to track who has already submitted and what information is ready, all in one place. Ellen can simply schedule a reminder to send to those who haven’t submitted yet. 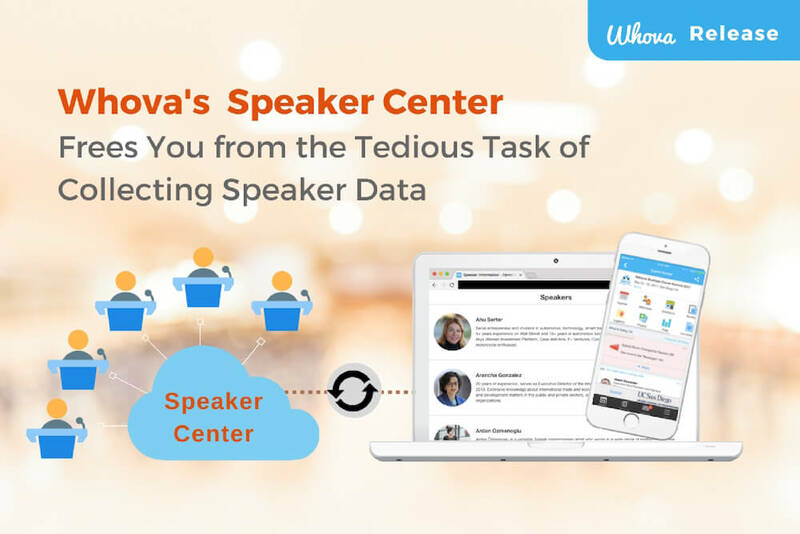 The Speaker Center is seamlessly integrated with Whova’s Agenda Center, so she can directly make an event schedule with Speaker Center’s session information without having to copy the information out. Here is a sleek web page including speakers’ information. No need to manually create! 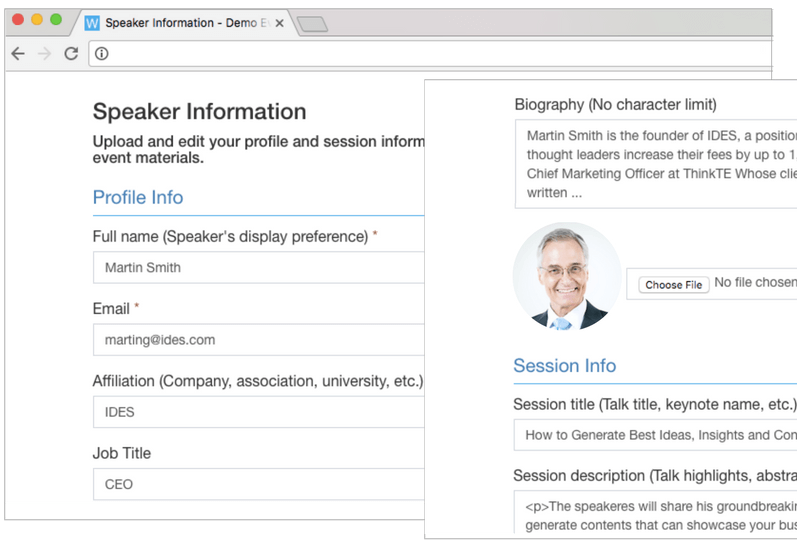 The Speaker Center automatically creates professional-looking web pages listing speakers and their biographies, so all Ellen has to do is copy and paste a single line of code provided by Whova into the event websites or registration pages. It’s so easy, with no need to know HTML codes or manually input speaker information. The web page layout is customizable with one click. As the Speaker Center connects speakers, event websites, and the mobile brochures in the Whova event app, any updates made by speakers can easily sync within all those places. So busy organizers don’t need to worry about inconsistent information or last minute updates, and instead can enjoy more time pursuing more important tasks for the event. Would you like to increase attendees’ participation in sessions and help them connect with speakers? 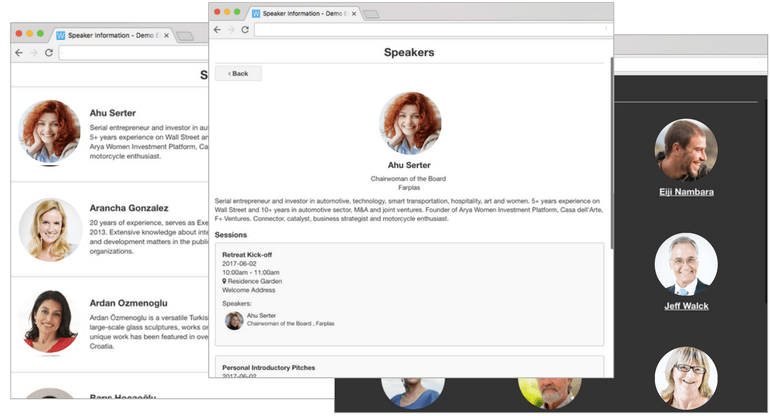 Through the Speaker Portal, speakers can easily recommend interesting web articles and news related to the session topics or themselves. The shared articles will be listed in the Whova app in a beautiful way. Attendees will get more interested in speakers and the sessions, discuss with others even before your event begins, and get the most out of the sessions. Check out Whova’s Article Sharing feature here: Pre-event Buzz? Audience Participation? Article Sharing Can Increase Both. Ready to reduce your stress at your next event? 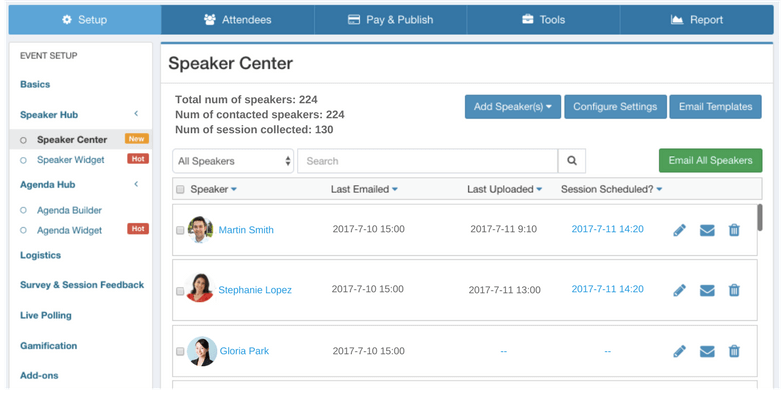 Start collecting and managing speakers and session information the easy way with Speaker Center. It’s a win-win situation for all: you have a cost-effective way to direct your focus elsewhere, while your speakers have the luxury of being able to instantly update their information all on their own. And remember, if you already use the Whova event app, Speaker Center is available for free. Request more information or contact us to get started now.